A Special Passage Through Asia E-Learning . Published 2009 . Publisher: Association for the Advancement of Computing in Education (AACE). presents e-learning activities, primarily within higher education, taking place in eight countries from East, Southeast, South, and Western Asia. As is evident, each country has unique issues, challenges, opportunities, and initiatives related to e-learning and the use of technology in education. Bonk, C.J., Lee, M.M. & Reynolds, T. (Eds.). (2009). 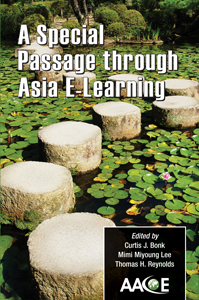 A Special Passage Through Asia E-Learning . Association for the Advancement of Computing in Education (AACE). Retrieved April 22, 2019 from https://www.learntechlib.org/primary/p/32264/. Aydin, C.H., & Tasci, D. (2005). Measuring readiness for e-learning: Reflections from an emerging country. Educational Technology& Society, 8(4), 244-257. Barton, S.M., Corbitt, B., Nguyen, L., & Peszynski, K. (2006, December) Cultural factors behind the growth of e-learning in Malaysia: Academic Guanxi. Presented at the 17th Australasian Conference on Information Systems, Adelaide, Australia. Bates, A.W. (2000). Managing technological change: Strategies for college and university leaders. San Francisco: Jossey-Bass. Campbell, M., Goold, A., & Goward, P. (2004). Using online technologies: Does culture matter? In G. Richards (Ed. ), Proceedings of World Conference on E-Learning inCorporate, Government, Healthcare, and Higher Education 2004 (pp. 2300-2307). Chesapeake, VA: AACE. Chadha, G., & Kumail, S.M.N. (2002). E-Learning: An expression of the knowledge economy. New Delhi: McGraw-Hill. Chen, X., & Chen, C. (2004). On the intricacies of the Chinese Guanxi: A process model of guanxi development. AsiaPacific Journal of Management, 21, 305-324. Chen, X., & Wang, Y. (2004). Use synchronous chat to improve online learning experience. Proceedings of the Tenth Americas Conference on Information Systems. Corbitt, B., & Thanasankit, T. (2001). The challenge of trust and guanxi in Asian e-commerce. In M. Singh& T. Teo (Eds. ), e-Commerce Diffusion: Strategies and Challenges (pp. 141-158). Corbitt, B.J., Holt, D., & Seagrave, S. (2006, October). Strategic design for Web-based teaching and learning. International Journal of Web Based Teaching and Learning Technologies, 1(4), 15-35. Davies, H. (1995). China business: Context and issues. Longman Asia Ltd, Hong Kong. Djojosaputro, L., Nguyen, L., & Peszynski, K. (2005). Cultural dimensions in online learning. Proceedings of the 16th Australia Conference of Information Systems, Sydney, Australia. Fetterman, D.M. (1998). Ethnography: Step by step. USA: Sage Publications. Hofstede, G. (2001). Culture's consequences: Comparing values, behaviors, institutions and organizations across nations. London: Sage Publications. Hofstede, G. (2005). Cultures and organizations: Software of the mind. London: McGraw-Hill. Hyland, A. (2003). To teach online or not? The decision facing university teachers. Higher Education Research and Development Society of Australasia (HERDSA) Conference, Christchurch, New Zealand, 6-9 July. Lanham, E., & Zhou, W. (2002). E-Learning: Literature survey. Geelong: Deakin University. Rogers, E.M. (1976). New product adoption and diffusion. Journal of Consumer Research, 2, 290-301. Rogers, E. (1995). Diffusion of innovations. New York, NY: The Free Press. Singh, H. (2004). Succeeding in an asynchronous learning environment. In G.M. Piskurich (Ed. ), Getting the most from online learning. San Francisco, CA: Pfeiffer. Huang, F. (2005). Qualitative enhancement and quantitative growth: Changes and trends of China's higher education. Higher Education Policy, 18, 117-130. Iiyoshi, T., & Kumar, M.S.V. (2008). Opening up education: The collective advancement of education through open technology, open content, and open knowledge. Cambridge, MA: MIT Press. Klenowski, V., Askew S., & Carnell, E. (2006). Portfolios for learning, assessment and professional development in higher education. Assessment and Evaluation in Higher Education, 31(3), 267-286. Latchem, C., Jung, I.S., Aoki, K., & Ozkul, A.E. (2008). The tortoise and the hare enigma in e-transformation in Japanese and Korean higher education. British Journal of Educational Technology, 39(4), 610-630. Mahbubani, K. (2007, December 19). Make way for the rise of Asia. Newsweek. Retrieved online March 3, 2009, from http://www.newsweek.com/id/80934 Morgan, J.H. (2008). The gathering storm: Accreditation and the search for accountability in American higher education. South Bend, IN: The Victoria Press. Perelman, L.J. (1992). School's out: Hyperlearning, the new technology, and the end of education. New York: William Morrow. Reeves, T.C. (2006). How do you know they are learning? The importance of alignment in higher education. International Journal of Learning Technology, 2(4), 294-309. Smith, P. (2004). The quiet crisis: How higher education is failing America. San Francisco, CA: Jossey-Bass. Stensaker, B., & Harvey, L. (2006). Old wine in new bottles? A comparison of public and private accreditation schemes in higher education. Higher Education Policy, 19, 65-85. Tiwari, S. (2005). Education in India. New Delhi, India: Atlantic Publishers. Twigg, C.A. (2003). Quality, cost and access: The case for redesign. In M.S. Pittinsky (Ed. ), The wired tower: Perspectives on the impact of the internet on higher education (pp. 111-143). Wergin, J.F. (2005). Waking up to the importance of accreditation. Change, 37(3), 35-41.